Co-founder and director of Global Witness, Charmian Gooch, has been honoured as Fellow of Aberystwyth University. Global Witness is a non-profit organisation campaigning to end environmental and human rights abuses which are driven by the exploitation of natural resources and corruption in the global political and economic system. Charmian jointly led Global Witness’s first campaign, exposing the trade in timber between the Khmer Rouge and Thai logging companies and their political and military backers. She also developed and launched their campaign to combat ‘blood diamonds’, work for which Global Witness was nominated for the 2003 Nobel Peace Prize. An alumna of the University (BA History, 1987), Charmian won the annual TED Prize for 2014, and along with her co-founders of Global Witness, has received a Gleitsman International Activist Award and Skoll Award for Social Entrepreneurship. In 2014 she was named on Bloomberg Markets’ 50 Most Influential list. Charmian Gooch was presented as Fellow on Tuesday 12 July by Dr Engobo Emeseh, Department of Law and Criminology. Chancellor/Pro Chancellor/Treasurer, Vice-Chancellor, prospective graduates and supporters. It is an honour and a privilege to present Charmian Gooch as a Fellow of Aberystwyth University. Charmian Gooch is a foremost campaigner and investigator dedicated to exposing and addressing the deep dark underbelly of natural resources exploitation – the most egregious forms of environmental and human rights abuses- and its intricate links with corruption in the global political and economic system. She is director and co-founder of Global Witness, a non-profit organisation whose mission it is to campaign to end these abuses. · Global Witness's first campaign from 1995-1997 exposing the illegal trade in timber between the Khmer Rouge and Thai logging companies and how it helped fund the conflict. The advocacy leading on from this led to the closure of the border, depriving the Khmer Rouge of $90 million a year, a factor that undoubtedly contributed to their ultimate downfall. · Perhaps by far the best known investigation and campaign by Global Witness is that aptly named “blood diamonds”, which exposed how diamonds was fueling civil war in Angola and across Africa, facilitated by the practices of the global diamond industry which turned a blind eye to the sources of these diamonds. This led to the development of a whole new governance framework for a certification scheme in the trade in diamonds known as the “Kimberly process”. Charmian it was who developed and launched this campaign. For this ground-breaking work, Global Witness was nominated for the Nobel Peace Prize in 2003. · Other notable campaigns by Global Witness include that which led to the establishment of the EITI and PWYP in 2002 aimed at addressing corruption in the minerals sector; exposure of the illegal timber trade funding conflict in Charles’ Taylors Liberia resulting UN sanctions, forcing the renegotiation of an unfair Minerals contract by Mittal Steel in Liberia. Charmian, together with Global Witness co-founders Patrick Alley and Simon Taylor, was also the recipient of the Gleitsman International Activist Award In 2005. In 2014, they received the Skoll Award for Social Entrepreneurship, awarded to ‘transformative leaders who are disrupting the status quo’. Charmian was also named one of Fast Company’s 100 most creative people in business and appeared on Bloomberg Markets’ 50 Most Influential list. She is also a member of the World Economic Forum Young Global Leader Alumni Group. As an activist, Charmian is an inspiration. Her uniqueness and success as an activist is rooted in that rare ability to undertake thorough, well researched investigations, and transform a campaign into tangible mechanisms that can effect change on the ground. It is therefore all the more humbling when one realises that she and her co-founders at Global Witness started with a “first computer out of a bin outside their office and relied on friends and family to pay for their international calls”. It shows that she was really too idealistic to dare to stand on the side of the weak, the poor, the disenfranchised; taking on the powerful corporations, governments and the global economic governance systems. Example like hers allows all today, especially at the start of our journey after graduation to also dream a little… and hope… and act! Pro Chancellor, it is my absolute pleasure to present Charmian Gooch to you as a Fellow of Aberystwyth University. 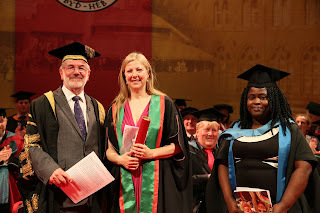 Photo: Charmian Gooch, Honorary Fellow of Aberystwyth University (centre) with Dr Glyn Rowlands, Pro-Chancellor of Aberystwyth University and Dr Engobo Emeseh, Department of Law and Criminology.